I have started using sleeping mask with my Korean skin care routine and loved using Laneige Water Sleeping Mask and Aritaum sleeping packs. They keep your skin hydrated for night and in morning you get soft and glowy skin. 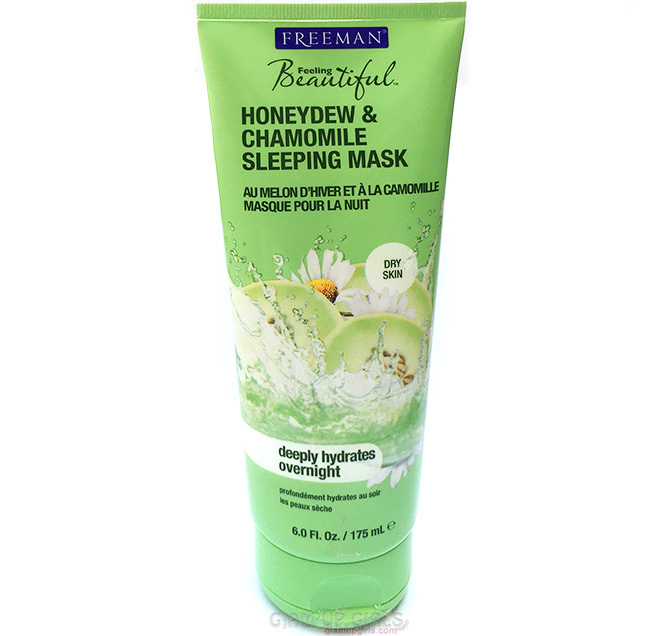 Once i spotted Freeman honeydew and chamomile sleeping mask, i decided to try it for my dry skin. I have been using it for few months and found some good and bad points about it and today i am going to share them. To wake up with dewy skin, you have to hydrate while you sleep! Our overnight sleeping mask with antioxidant-rich Honeydew and calming Chamomile is just the thing for rejuvenating skin. Deep moisturizing Coconut Oil makes rough skin a thing of the past, and Dimethicone dramatically smooths. Conditioning Jojoba Oil and moisture-binding Silk Amino Acids deeply nourish. Rinse upon waking to reveal well-rested skin that’s ready to face the day! Perfect for dry skin. 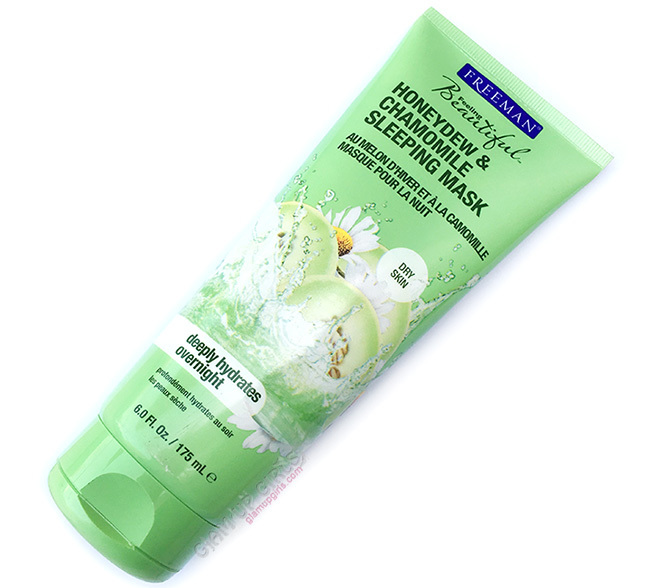 This sleeping mask comes in green squeezable tube with flip cap with honeydew(melon) and chamomile flower designed on it. The texture of this product is white, thick lotion like which applies smoothly. It has quite noticeable smell of melons and flower which is pleasant and not very bothering unless you do not like strong smells. Smell lingers for little time and then fades away. The texture of this product is very soft creamy and you need little amount to apply on face if you want a thin layer. However it is suggested to apply it generously like a face mask. I use it on face after cleansing and toning at night. It does sting a little on sensitive spots or dry patches for few minutes, if you have any, like around nose or forehead. After applying the layer of this mask, you do not need to absorb it into the skin. It does sink in skin after few minutes and doesn't feel heavy or greasy. It also doesn't stain your bedding as it claims. In morning, you will face extremely soft and hydrated skin and i cannot stop touching it. You can just wash with water and don't need to use any face wash or cleanser. If you have extremely dry skin, you will need to moisturize in morning or else can simply apply other products. It does make your dehydrated skin look plum, soft and if you have dry patches, it will get rid of them after few uses. Now coming to the bad points. it is no way good for oily or combination skin. 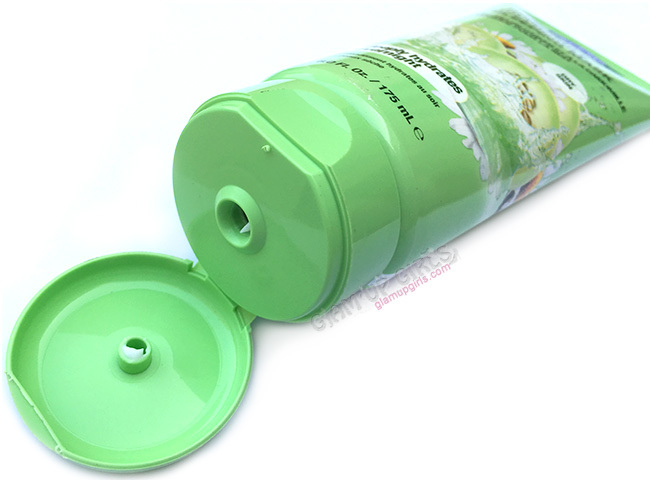 It is not exactly a bad point as the product is only suggested for dry skin. On oily, combination or skin which is prone to break outs, it will start break outs and you will find your skin having more zits. The reason is Dimethicone ingredient which is very good for dry, itchy skin but very bad for oily skin. Overall this product is really good moisturizer for dry skin but not at all for oily and combination skins. It makes dry and itchy skin soft, supple and hydrated. You can also use it on hands or other body parts for soft skin.